A home treadmill is a big investment, and it pays to do the simple maintenance to keep it running well for years to come. 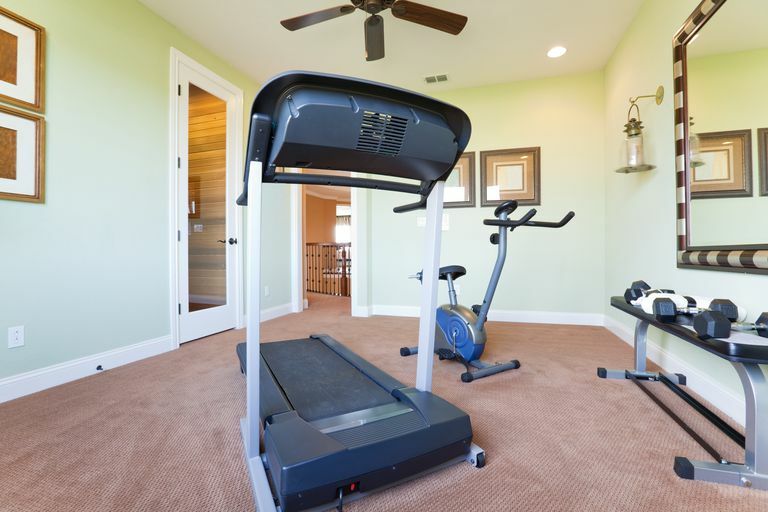 Dan Thompson of Huff-n-Puff Fitness Repair in the Chicago, Illinois, area tells how you can maintain your home treadmill. Wipe down after every use. Keep the walking belt centered and aligned. Install a treadmill mat underneath the machine. Wipe down: Wipe the machine down after every use. Provided you are working up a sweat, this is even more important. As moisture begins to build on the machine, it will promote rusting of its metal parts and will harbor bacterial and fungal growth. Notice Problems Developing: Pay attention to your treadmill with each use. If the machine is running rough or something is rubbing or scraping, discontinue use until you determine the problem. Ignoring them won't make them go away. Check the walking belt and deck: Check the walking belt and deck for signs of wear. Also, check the walking belt to make sure it is relatively centered and straight. It does not need to be aligned perfectly but ensures it is not scraping or rubbing on anything on the sides. Vacuum the area around the machine and underneath if possible. If you use your treadmill regularly, dust and debris will begin to accumulate at the rear of the machine. A small portion of it is from the walking belt but the majority of it is from the soles of the user's shoes. It is perfectly normal and nothing to be concerned about. Each month, check the frame nuts and bolts to ensure they are tightened and that the uprights attaching the console to the frame are secure. With regular use, Thompson says it is not uncommon for them to vibrate loose. Vacuum inside the motor compartment and underneath the machine. Before removing the motor cover to vacuum be sure to turn off and unplug the machine. Be very careful around all the delicate electrical components, being sure not to touch them with your vacuum nozzle. Lubricate once yearly at a minimum. Depending on the frequency, amount of use and the type of lubricant used it may need to be lubed more often. Thompson notes that people with pets definitely need to vacuum the motor compartment more frequently and try to keep the area around the machine as hair free as possible. Treadmill mats are a great way to minimize the amount of pet hair, carpet fibers, dirt and dust from the motor compartment. All that foreign debris can wreak havoc on your motor and motor control board which will result in costly repairs. Treadmill belt lubricant: Most use a silicone-based lube but some use a paraffin base. Thompson notes it is very important to use the correct type so please consult your owners manual or call the manufacturer to determine which is needed. WD-40 is not the correct lube for any treadmill. Thompson says it will destroy a belt very quickly and should not be used under any circumstances. A walking belt adjustment wrench should have been provided with your machine when it was purchased, if not your owners manual should list the size required. Thompson says that depending on your mechanical and electrical comfort levels, you can attempt maintenance yourself and get help with the calibration from your manufacturer's customer support line. If you remove your machine's motor cover and immediately think you are in too deep it is probably best to call a professional. As with any other specialty piece of equipment, a professional repair technician will be able to spot problems that may not be immediately apparent and correct them before they become a major issue. Where can you find professional help for treadmill maintenance and repair? TreadmillDoctor.com has a comprehensive list of certified service providers for the US by state, and also listings for Canada.